Each Christmas Eve, Vision Australia's Carols by Candlelight brings joy and beautiful music into homes across Australia. 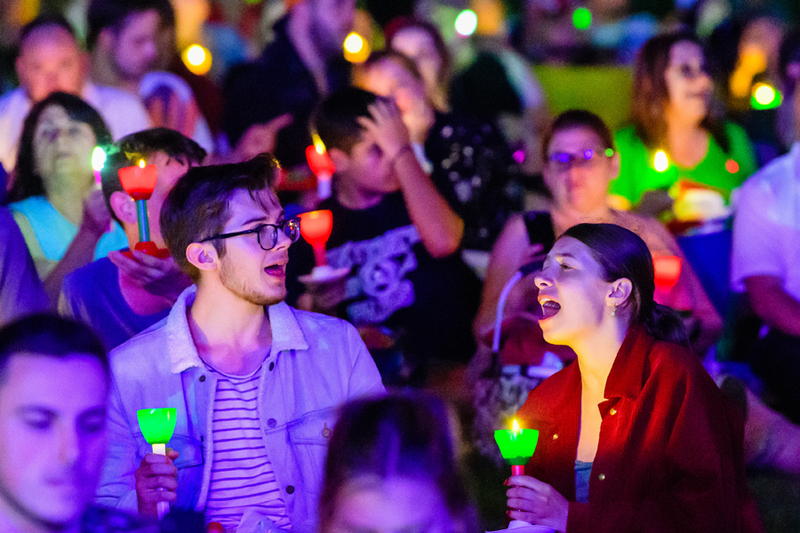 Make sure you sign up to the Carols Club for all the latest news, exclusive pre sales and incredible offers for Carols 2019! The weather forecast is in and we’re expecting a warm and sunny 31 degrees for Carols by Candlelight 2018. With that in mind, make sure you’re prepared to have a sun smart and well-hydrated Carols. Preparing for Carols 31 degrees is hot. Make sure to bring sun smart clothing, hats, and water. If you’re planning on queuing up through the day, make sure you have sun screen and sunglasses. Make sure you reapply your sunscreen every two hours! Any water bottles you bring into the Sidney Myer Music Bowl will need to be emptied before you enter the venue, but you can refill them inside the venue. Water stations are located at the back of the hill, to the right after entering at Gate 1, and inside the Christmas Festival next to our range of food trucks. If you’re feeling the heat, or if you feel unwell for any reason, we have first aid stations set up thanks to St John’s Ambulance. These are at the back of hill, to the right after entering at Gate 1, and inside the Christmas Festival. Run out of sunscreen on the night? No problem! Our first aid stations have extra sunscreen available. As well as water, you can bring your own non-alcoholic beverages on the night. Beverages need to be sealed and in containers not made of glass. Also to be considerate to other guests try and only bring a reasonable amount, a slab of soft drink per person is probably too much. To make sure you get enough shade you’re welcome to bring umbrellas to keep the sun away. Please only bring personal sized umbrellas, without pointy ends (for safety reasons) and make sure they are folded away by 7:45pm so that everyone can see the main performances. If you need a bit of shade but haven’t brought an umbrella, our Christmas Festival area has plenty of shade, as well as activities, rides, and food. Have questions about what else you can and can’t bring into Carols? Check out our guide here. So you’ve got your tickets, and you’ve prepared your picnic and your blanket, but what’s the best way to get to Carols? We’ve prepared this little guide to help you have a happy and painless experience getting to the event. Public transport The best way to find out how you should get to Carols on public transport is to check www.ptv.vic.gov.au. PTV have a journey planner which can help you work out the best route from your door to the event. The PTV website will also let you know if there are any delays or issues on the day, so check in! If you’re coming into the city by train the Sidney Myer Music Bowl is about a 15 minute walk (about one kilometre) from Flinders Street station through the Queen Victoria Gardens. You can also catch a tram from Federation Square outside Flinders Street station to the Grant St stop and walk from there. Driving in If you want to drive to Carols make sure you’ve worked out where to park. There will be some accessible parking available on Linlithgow Avenue right outside the Bowl for people with Parking Permit for People with Disabilities. If you’re using these parking spots make sure you have your sticker or pass to display! The next closest available parking is Arts Centre Melbourne, a 10-minute walk from the venue. The best way to enter the Arts Centre Melbourne Car Park is to take the Sturt Street Exit from City Road (when travelling west-bound on City Road) and make a left into the Arts Centre Car Park. Please note that due to road works, you cannot access Southbank Boulevard from St. Kilda Road. Dropping off If you’re getting dropped off at Carols the best spot for you is the corner of Linlithgow Avenue and Government House drive. Friendly staff from the Arts Centre will be based there to offer assistance. If you need assistance there will also be a golf buggy taking people from the corner of Linlithgow Avenue and Government House drive into the Bowl. You can pre-arrange this service by contacting Arts Centre Melbourne on 1300 182 183 or on the day by speaking to Arts Centre staff. However you’re getting to the event we’re looking forward to seeing you there! And if you’re thinking of travelling light why not read about all the food and drink we’ll have available onsite? As Carols by Candlelight approaches, we’d like to highlight some of the excellent food providers who are supporting us in 2018. Keep an eye out for these delicious delectations, and so many more, at the Christmas Festival! Villa Maria Wine Garden For the fourth year in a row. Villa Maria is the highest ranking New Zealand winery in this year’s “World’s Most Admired Wine Brands” list. Said Sir George Fistonich, founder and president of Villa Maria Estate, “being named as the most admired wine brand in New Zealand four years in a row is testament to the level of quality our wines consistently deliver and shows we exceed in all the award criteria. It’s such amazing recognition for Villa Maria and I’m incredibly proud that we continue to rate the highest New Zealand winery on this most prestigious of lists.” A leader in sustainability, innovation and quality, Villa Maria is a family owned winery recognised as an icon in the New Zealand wine industry, and their travelling wine truck will be present at Carols by Candlelight 2018 for you to sample this incredible wine! Barista coffee by Brewtech Brewtech is an industry leader in the Melbourne specialty coffee market, a coffee-loving team who supply premium equipment, sales and servicing to many of Melbourne's best cafes, restaurants and coffee roasters. Brewtech is very proud to be supporting Vision Australia’s Carols by Candlelight in 2018. This year Brewtech is also providing coffee for all our staff and performers, giving them the buzz and the energy they need to provide and support such quality entertainment! Goldeluck’s Doughnuts Goldeluck’s Doughnuts was established in 2018 by Phillip Kuoch. Since their humble beginnings, they have served more than 350,000 customers and regularly been featured as one of the best doughnut shops in Melbourne by publications such as the Herald Sun and Concrete Playground. With stores in Croydon South and Eastland, Goldeluck’s is notorious for its innovative, award-winning doughnuts which not only taste great but look amazing! Goldeluck’s delicious doughnuts are totally unique, and we’re thrilled to have them join us this year for Carols by Candlelight. This year they will be teaming up with Vision Australia Radio, and together their stall will share the great services that Vision Australia’s audio team provide to the community while Goldeluck’s will be selling their world famous doughnuts with all proceeds going towards the 4x Brighter Appeal. Carols by Candlelight 2018 is almost here! Hopefully you have booked your tickets and started making plans for a night of celebration and song. To help you have the best night possible we’ve put together a short list of what to bring, and what things are best left at home. What to bring: Your copy or copies of the Carols by Candlelight Songbook, available in the Herald Sun or from our website Comfortable clothing appropriate to the weather, including hats and sunnies for sun safety in the afternoon, and rain-jackets or ponchos in case of rain! Collapsible prams are also welcome, although these must be cloaked when you arrive Picnics are welcome in appropriate containers (see below), along with your picnic blankets There are ATMs available on site, but bringing some cash is recommended for easier, quicker purchase of beverages and other items Your loudest proudest singing voice and lots of Christmas cheer! What to leave at home: BYO Alcohol or any glass containers are not permitted at this event! Best to purchase beverages on-site Guns, fireworks, drones and other dangerous items are obvious no-nos! Please don’t bring wax candles; electronic ones will be available for purchase at the event, with all of the proceeds supporting kids who are blind or have low vision Please don’t bring any metal knives, including cheese knives For a better viewing experience for your fellow audience members, please leave behind any portable seating higher than 20cm off the ground, including hard eskies that could be used as a seat. This also goes for tables, tents and sun shelters inside the venue. No pets please; assistance animals only are permitted Pointy umbrellas can be a danger and a viewing obstacle to those behind you, so please leave them at home or try to bring an umbrella without a sharp end. If the weather looks poor, bring raincoats or ponchos We ask that you don’t bring any glow sticks, laser pointers, selfie sticks or professional cameras (phone cameras are okay!) Please note that bag checks will take place at the gate and prohibited items may be refused or confiscated. We’re looking forward to seeing you all at Carols by Candlelight and we hope you have a fantastic time with your friends and family. Don’t forget to share your photos with the hashtags #carolsbycandlelight and #4xbrighter! Carols by Candlelight sees the community come together to support children who are blind or have low vision and their families. All of the funds raised through Carols by Candlelight provide services for kids across the country, whether it’s through orientation and mobility for schools and kindergartens, sports and music activities, or our Feelix library. We want to make Christmas brighter for kids like Parker here to live the life they choose.